Since the sociopolitical crisis in Nicaragua started last year, the regime of Daniel Ortega and Rosario Murillo has been exposed not only for brutally repressing the population, but also for inflicting misery on thousands of Nicaraguans with its tax policies. Currently, the country finds itself in the midst of an extreme economic recession, a minimum wage freeze and an increase in the prices of electrical energy and fossil fuels. Now, with the law of tax harmonization that went into effect a few weeks ago, the price of the basket of basic goods increased by 13.5 percent in food and home products alone. That doesn’t include basic services and clothing. Before January, a family of four spent 9,615 córdobas a month on food and house products, according to data from the Central Bank of Nicaragua. Now to buy these same products in the market, a family has to spend an extra 215 córdobas. Furthermore, if people do their shopping in the supermarkets, the cost increases from 9,615 to 10,917 córdobas, an increase of 1,302 córdobas. 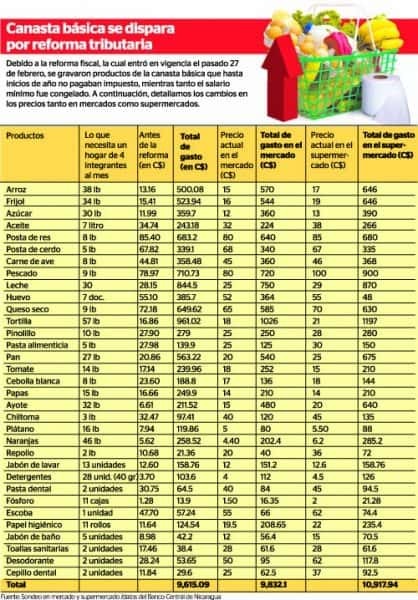 According to a study carried out by La Prensa, prices for detergents, sanitary pads, toilet paper, brooms, soap, deodorant and toothpaste and tooth brushes increased the most. 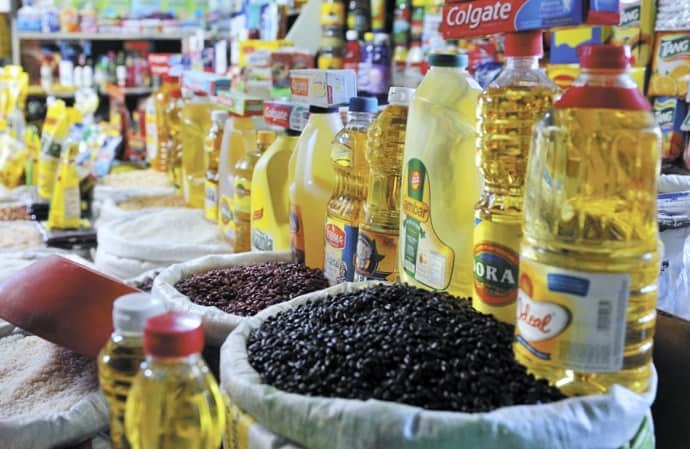 The prices of most food products have remained stable. Economist Luis Murillo says that it was not the most suitable moment to carry out tax reform, which ultimately was most damaging to the consumer, already affected last year by the sociopolitical crisis. The economist states that now money is starting devalue not only because of the recession, but also because the government is seeking increased revenue through this reform. “Because of this reform the standard of living is decreasing even more. Additionally, wages are currently frozen. In other words, it is punishing the consumer… This reform ought to have been applied four years ago when the economy was growing instead of now. It would be better to have expansive policies now, to remove taxes from certain products so that the crisis does not worsen,” said Murillo. He also said that measuring the basic basket of goods, according to the parameters used by the maximum banker issuer, is an obsolete methods no longer used in the region. This means that, in reality, the cost to the consumer is even higher than expected. Juan Carlos López, coordinator of the Judicial Center of Consumer Help (CJSAC), said that the impact of the taxes may increase in the coming months. “What is going to happen? If they are part of secondary products and they depend on products that were in some way recorded, ultimately all the tax will pass to the consumer and the increase may be bigger than what the law takes into account. Ultimately, the wallet of the consumer is most affected,” said López. He said that with this new tax charge, the consumer will have to choose between paying the cost, buying products of lower quality or not buying certain products. “There are products that are not within the basket but that if they are bought continually in the home, that were taxed and this has a weight. I think that many families are not going to be able to maintain the same standard of living and others have already entered into poverty. The worst is that these decisions affect the consumer, and we are never taken into account. The consumer has neither a voice nor a vote,” he added. Last year, as a consequence of the sociopolitical crisis 453,000 people were fired and suspended, out of which 137,000 find themselves unemployed, according to a 2018 report from the Nicaraguan Foundation for Economic and Social Development (Funides). Through January of this year, the family basket of 53 products cost 13,500.85 córdobas, according to data from the Central Bank. In other words, it decreased by 64 córdobas since December 2018 and increased 103 córdobas since January of last year. The price of the basic food basket in Nicaragua was equivalent to three minimum wage salaries of the agriculture sector (4,176.49 córdobas) in January. In other words, a minimum wage salary covers only 31 percent of the basic basket. The law of minimum wage establishes that one of the parameters to measure the salary increase is the price of the family basket. This year, the Ortega administration sought to freeze minimum wage. Excerpted from the original story in Spanish at La Prensa, first published on March 18, 2019.